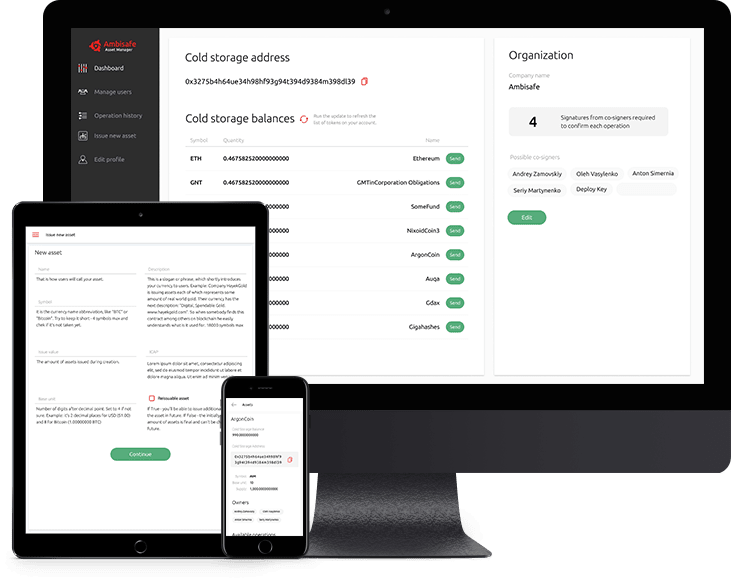 Enterprise multi-signature wallet for digital assets storage and management. 1. AmbiVault helps to enhance the security of your digital assets from unauthorized access. 2. Manage smart contract functions through a user-friendly interface. Giving one person control over all of your assets is a big risk. AmbiVault allows you to set the number of users needed to execute network actions. You may alter co-signing rights for other users in the organization. You can also change the number of signatures needed to confirm new operations. AmbiVault allows you to create new ERC20 tokens. You may also change the total token count by creating or revoking new tokens. These operations will change how many of your tokens exist on the blockchain. - Change the transaction fees depending on the Blockchain network load. This ensures that you process transactions at the correct time. - Choose who pays Blockchain transaction fees: token creator or end users. - Driven by smart contracts in the Ethereum blockchain. - Private keys are stored in encrypted containers and cannot be decrypted on the server side. Security is an important part of any blockchain project. Anyone with access to your cold storage could potentially steal all your assets. Don't like that idea? AmbiVault is here to help.